ATTENTION! SOME SELLERS ARE CHARGING VERY HIGH PRICES FOR SELFLESS SELF! DO NOT PAY MORE THAN 650 rupees! IF YOU LIVEIN INDIA & WISH TO PURCHASE BOOK, BUY IT ONLY FROM "SANSRACK" on Amazon India! Audio Recordings of first ten chapters! 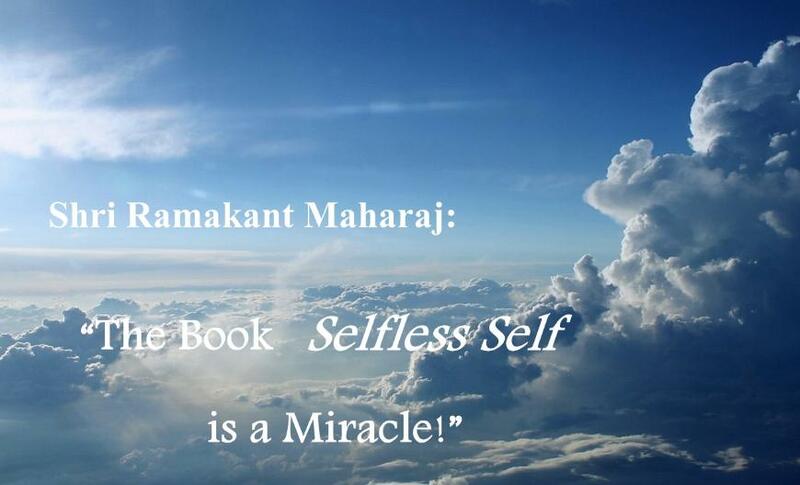 "The crystal clarity of Shri Ramakant’s teaching is truly amazing... It seems that even the Divine is able to top itself when it comes to dishing out its highest wisdom, further sharpening the pinnacle of knowledge so that the bubble of illusion can be easily pierced. So if there is ever a benchmark to recognize a genuine Master and His teaching, Selfless Self is it.” Holland. "...In spite of having Nisargadatta, Ranjit, and Siddharameshwar at hand out here, I can't read anything but your/Maharaj's book. It is incredibly poignant, direct and penetrating. Wiping concepts ruthlessly. I am so thankful for what you've done … Thank you, as I thank God." Your book is a staggeringly powerful agent and gospel of Truth. "I feel such a strong strong connection with Sri Ramakant Maharaj. I trust completely what he says. I trust this lineage and my whole beings tells me that he is a true guide, showing us , hammering us with what we have simply forgotten. So so amazing, what a blessing." "The book is Maharaj and Maharaj is the book." Anon. 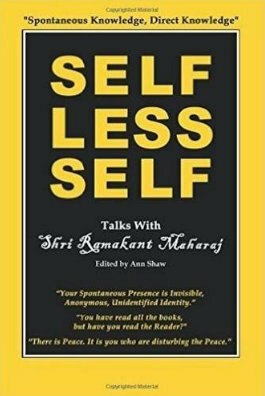 the Editor of 'Selfless Self': "My Master, Shri Nisargadatta Maharaj, inspired you!By the Grace of my Master,the book is a Miracle." 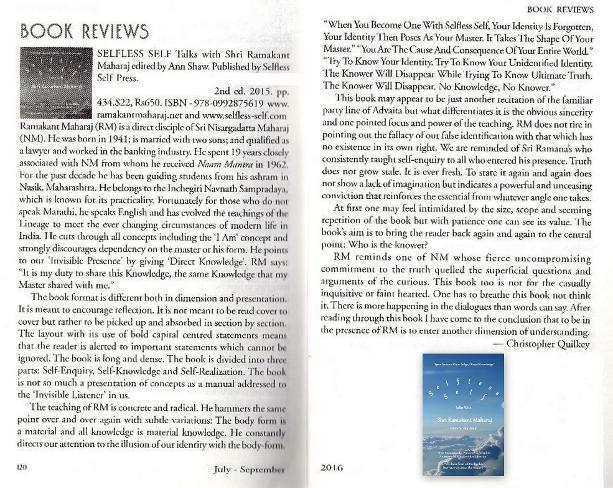 Alan Jacobs, President Ramana Maharshi Foundation UK 5 *****Star Review ! 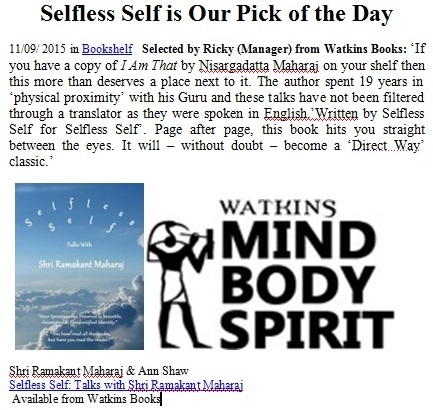 "Selfless Self is a marvellous, outstanding book that will help many of Sri Nisargadatta Maharaj's followers and others. 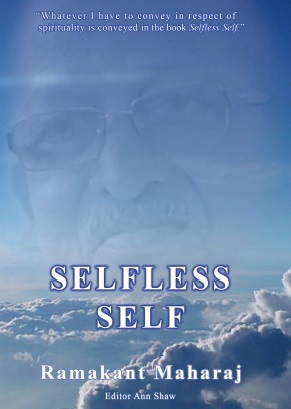 I have no doubt about Sri Ramakant Maharaj being a Realized Master. I greatly admire the content. Wonderful! 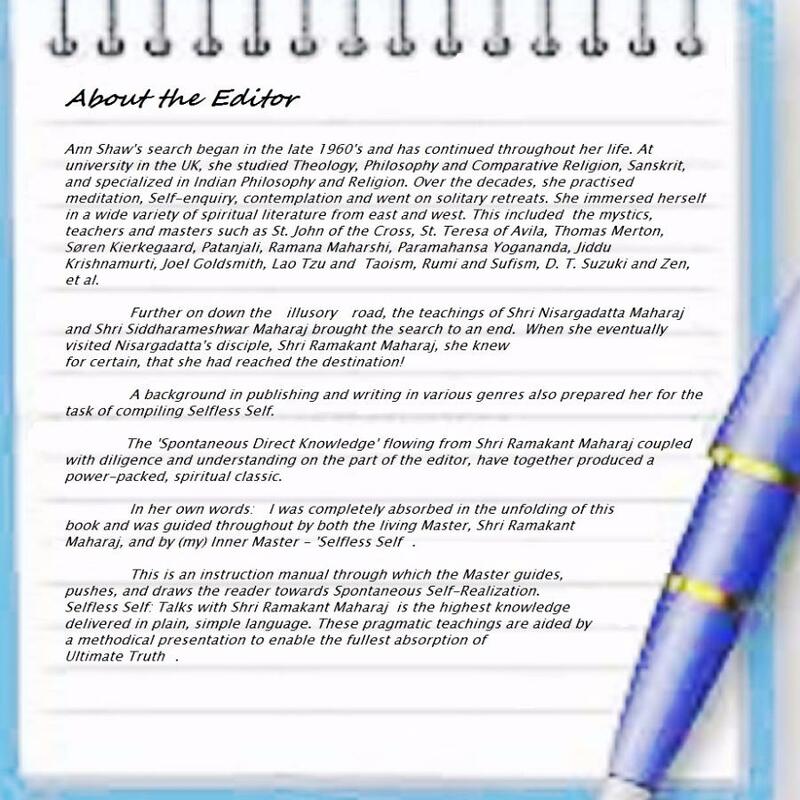 Ann Shaw has done truly remarkable work in editing this great spiritually encyclopaedic work recording the Teachings of the Self Realised Sage and Jnani, Shri Ramakant Maharaj, successor to the esteemed Jnani, Nisargadatta Maharaj. 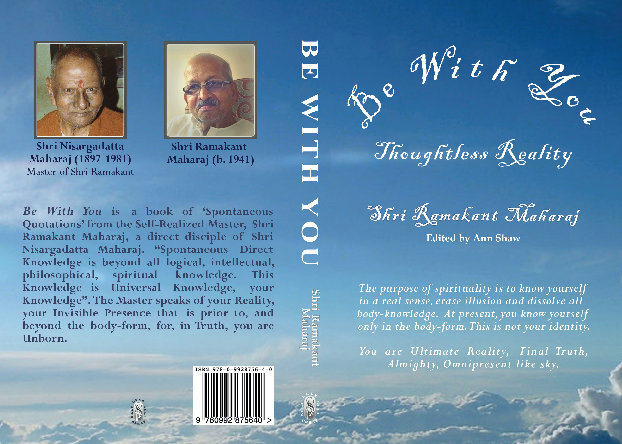 In over 500 pages Sri Ramakant explores every aspect of the necessary Spiritual Practices or Sadhanas, which are needed for the ardent aspirant to achieve Self Realisation. In this important book questions are put to the Sage and then lucid answers are given which are precisely appropriate to the question. 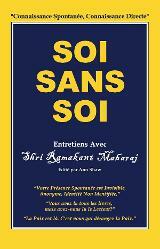 In this book the earnest aspirant will surely find the question and answer appropriate to his or her need. In reading the whole book he or she will find all that is essential for him or her to form their own synthesis, and proceed on their great journey towards Enlightenment. 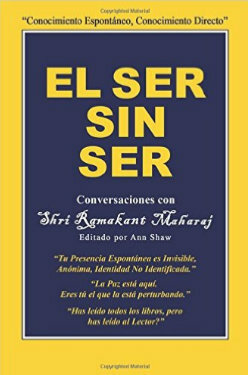 This is truly a great book and a worthy successor to the much celebrated 'I AM THAT' written by Sri Ramakant's own Master, Sri Nisargadatta Maharaj." Timothy Conway, teacher of 'Advaita spirituality' for nearly 30 years, and author of 'Women of Power and Grace', Santa Barbara, CA, USA: "The teachings of Sri Ramakant Maharaj bear the stamp of complete authenticity and the power to awaken aspirants to innate Awareness. A beautiful book emerging within the Divine dream." 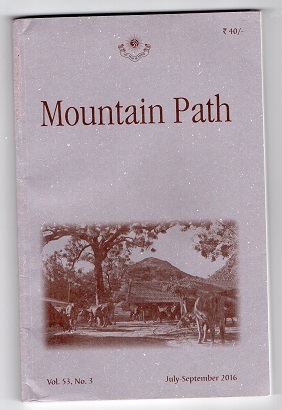 Christopher Quilkey, Editor, ‘Mountain Path’ Quarterly Journal, Sri Ramanasramam." Not just another book on awakening.